Every time I attend a convention, there are things I learn and many more things of which I am reminded. This year’s SDCC was no different. Here are ten of the things that stood out to me this year that I would like to share with you. 1. It’s worth taking the chance by waiting in line. I honestly had no real hope of getting into Hall H because I didn’t plan on camping out in the lines overnight, but there was a small part of me that thought that because the programming was different than most years, I might be able to get in. I took the chance on Friday morning and I was blown away at how short the line was. I ended up sitting in on the Dr. Horrible’s Sing Along Blog reunion panel, Fear the Walking Dead, The Walking Dead, and Star Trek: Discovery. It was an amazing experience. If you have the chance, wait in line. You won’t regret it. 2. Those emergency items I always bring but never seem to use ARE important. I have never gotten blisters before, but I always bring adhesive bandages just in case. I ended up hitting over 30,000 steps on Friday, and was over 28,000 on a couple other days. Boy, did I need those bandages this trip! Even if you don’t use them on most trips, go ahead and pack those emergency items just in case. 3. Go to panels that are related to your industry. I have been working on some nerd fashion lately, and there were so many panels this year that were either on geeky fashion or on running a business. I was able to attend a couple of these panels and there was a wealth of information available. There are people out there who are more than willing to share their knowledge, so take advantage of it! I was blown away with how helpful everyone was. If a panel is in your field, try not to miss it. 4. Fight your comfort zone. I am absolutely terrible about overthinking and boxing myself into a corner, and I cannot make my own introductions for the life of me. The rational part of me knows that people probably don’t even realize how frightened I am, but I can’t seem to get over it. It hit me multiple times that I need to fight my comfort zone and try to make those introductions anyway. 5. Always carry business cards. Along the same lines as making the introduction, you always want to have business cards on your person. This is one of those things that I knew, but its importance was reaffirmed during this convention. There were several situations where someone struck up a conversation with me and I was incredibly thankful that I had my personal info ready to pass along. 6. Carry tissues when attending a John Barrowman panel. I have been to several panels with the lovely John Barrowman and was fortunate enough to attend his panel at SDCC this year as well. It was much like the other times I’ve seen him, but somehow it is always something new. He had a gorgeous cosplay, his hilarity ensured I had a fabulous ab workout, and I ended up crying both from laughter and because I was incredibly moved. 7. 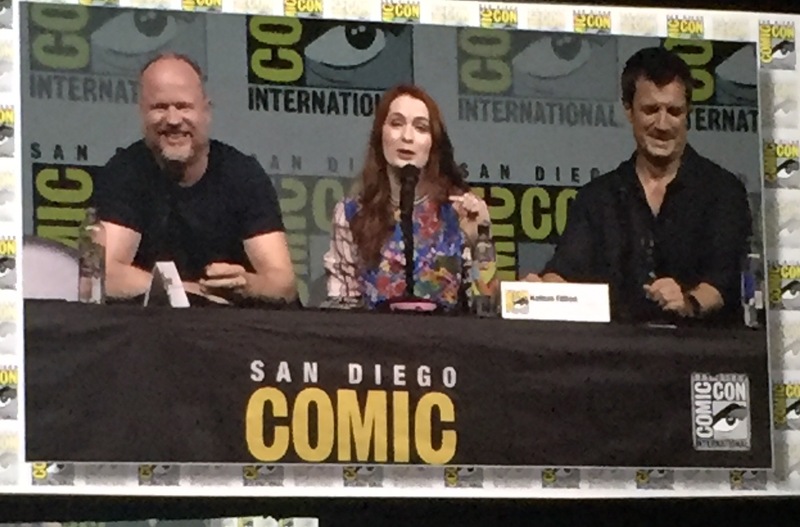 Nathan Fillion and Felicia Day are beautiful human beings. 8. Put the Lyft app in your convention folder. I live in a small town, so the only times I’ve really utilized a Lyft is when I’m in San Diego and someone else ordered it. I went ahead and added it to my convention folder in my phone, and I ended up using it a few times after a long day of walking and then dancing the evening away. I may only use it once a year, but it saved my legs. 9. Doggos make every convention better. Normally I would be against bringing a dog near the convention floor, but I saw so many dogs at SDCC and it was GLORIOUS! I was heartbroken that I had to leave my little man at home, but seeing all those other pups helped me to feel a little better. It was especially fun seeing the cuties in cosplay. I can’t wait until I can take Toto Baggins with me. Now which cosplay will we wear first? 10. Meeting up with friends old and new is the very best part of SDCC. As much fun as the convention is with the art, the vendors, the panels, and the exclusives, the best part of Comic Con is meeting up with friends. I have several friends that I only see during this one week every year, and it’s wonderful to meet up with them and to meet new people every year who I can add to that family. 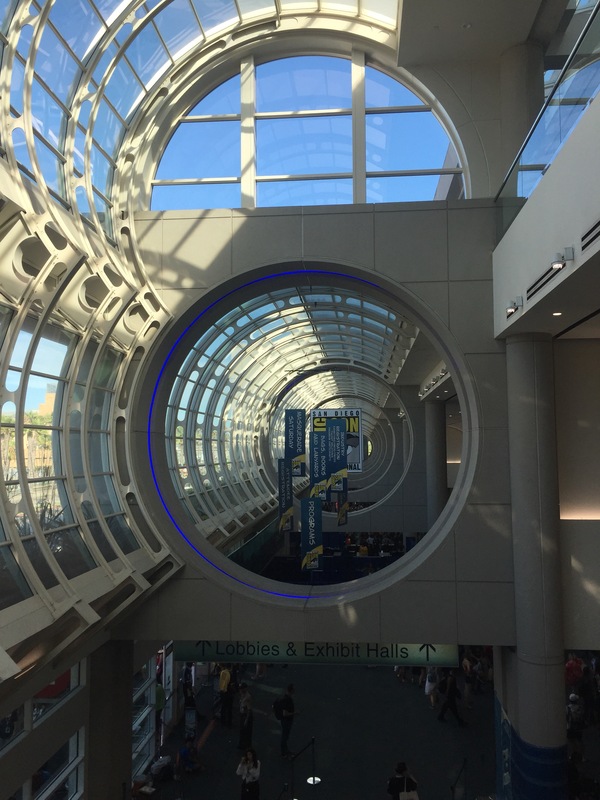 What kinds of things did you learn or were you reminded of at San Diego Comic-Con this year? Comment below to share your experience or tweet me at @amlehr! Seeing friends and meeting new friends this year was glorious. I really needed a shot of friendship in my nerdy life this year. And we met so many new wonderful people too. That’s a good one! I found the app helpful this year so that I always knew what the hours were and when/where panels were without having to carry around my hard copy. I’d recommend noting, knowing ahead, or looking up the *capacity* of any room where a panel you’re dying to see is being held. Then count-off approx. people as you hike the wait line to realistically assess whether you may make it in or not….still keeping in-mind that some rooms to do not clear attendees of a just-previous panel. It’s pretty frustrating to get to a panel early, *thinking* a wait time of X hours ought to cover it, and line attendants keep lining people up, assuring them they will get in….and then it doesn’t happen. A lot of valuable time can be wasted waiting in lines for room capacities that NOWHERE NEAR can hold the very obvious line forming that wraps around buildings. Con management could do better on this one, me thinks. Ooh! I hadn’t thought of that. Great idea!